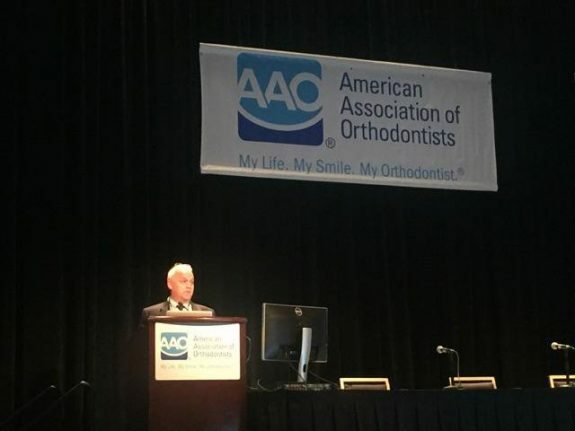 American Association of Orthodontists 2018 annual meeting in Washington DC. 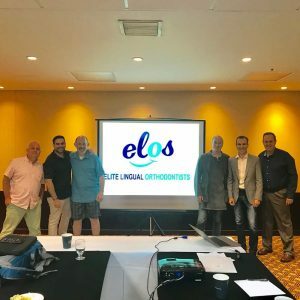 Dr Riolo’s presentation last year was titled “Lingual Orthodontics: replacement of impacted and missing anterior teeth”. Dr Riolo will be outlining a new technique for the provisional replacement of anterior teeth during orthodontic treatment using cutting edge 3D printing technology. Our new pontic fabrication technique allows integration of the replacement tooth into the design of the custom lingual appliance system and therefore maximizing efficiency and aesthetics for the patient. Dr Riolo’s lecture is focused on the advantages of lingual appliances in orthodontic treatment. We have been using our Juell and Formlabs2 3D printers to fabricate pontics from either our STL library or those impacted teeth “digitally extracted” and converted from 3D radiographic images to STL file then the impacted canine is “extract” from the STL file edited and printed. the printed tooth is then used in order to fabricate an aesthetic pontic for the patient. the extract STL is also incorporated into the custom appliance system used in the patient orthodontic treatment. Our 3D printing technology has improved care for our patients by enabling us to provide retainers the same day as the braces removal and printing temporary replacement teeth used during treatment. 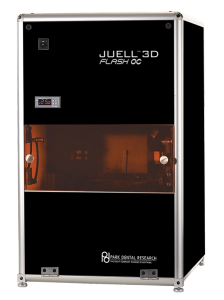 JUELL 3D is one of the fastest 3D printers on the market today, Print orthodontic models for complete clear aligner treatment in under 30 minutes without compromising resolution or accuracy. Builds at speeds as fast as 7 seconds per layer! Unbelievable accuracy achieved by using enhanced UV/DLP/LED technology and JUELL 3D Flash OC software to project an HD image with 1920 x 1080p resolution. Print from an intra-oral or tabletop scanner using .stl, .obj, .3ds or .amf file. Print jobs are scalable. Build a quadrant or 18 arches with supports! The layer build time remains the same. First we take a scan with our intra-oral digital scanner. subsequently, the digital model of the teeth is edited, a base is added and holes are filled and the model is smoothed out. The digital model is then uploaded to the 3D printer. 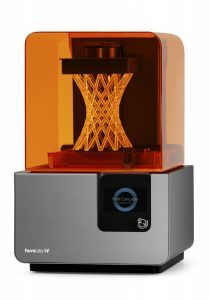 The Juell printer employs SLA (Stereolithography) printing technology which hardens photo sensitive resin layer by layer with a ultraviolet light. Each small layer builds on the last. This SLA technology is used in the production many orthodontic appliances including Invisalign. Our TruDefinition intra-oral scanner is less invasive and more convenient than the traditional impressions. The 3D scan and 3D printing is also more accurate than impressions so the retainer will fit your teeth perfectly. Since the these digital models are printed in house we can turn these models around the same day! We also can fabricate custom pontics (replacement teeth) in house and integrate these teeth into your custom orthodontic appliance system. All of our models are stored digitally and we give our patients copies of their final printed models of their teeth. In addition, as a direct result of our 3D printing capabilities Riolo Orthodontics now offers replacement retainers for a lifetime. We use the 3D printer to print models of your teeth and create retainers, aligners and many other orthodontic appliances. Combined with the 3D digital scanner it can create models of your teeth that are much more accurate. Furthermore this method will create a more accurate retainer compared to the traditional method of taking a mold of your mouth. After you get your retainer you can keep the 3D printed version of your teeth. This model can be brought in to make a new retainer if you lose your retainer or your dog happens to chew it. We also keep a digital copy of your teeth that can be reprinted if you happen to lose both your retainer and 3D printed model. First we take a scan with our intra-oral digital scanner. Next the file is edited to have a base added and so that it is smoothed out. After the file has been edited it is uploaded to the 3D printer. Our Printer employs SLA (Stereolithography) printing technology which hardens resin with a ultraviolet laser in very small layers building upon each other. After the print the build supports of the model are removed. The model is then soaked in a bath of isopropanol for two sessions of ten minuets. After that you are left with an orthodontic model. This SLA technology is used in the production many orthodontic appliances including Invisalign. The intra-oral scanner is less invasive than the traditional impressions. Since the these digital models are printed in house we can turn these models around the same day! We now have the ability to produce retainers the same day as the braces are removed. This means there is no chance the teeth will move before you get your retainers. The 3D scan and 3D printing is also more accurate than impressions so the retainer will fit your teeth perfectly. We are continuously working to improve the quality and convenience at Riolo Orthodontics. You can contact us at SeattleOrthodontist.com to make an appointment or just ask us a question.